HomeMom Blogs:All AkimboAll Akimbo: Baby picture! I was so nervous about my Monday-morning ultrasound on Sunday night that I could hardly sleep. Well, that’s not exactly true … I slept like a log until about 2 a.m., then I was wide-awake until 5 a.m., only to finally fall back into a deep slumber until the alarm disrupted a very elaborate dream I couldn’t possibly explain at 6:45 a.m. 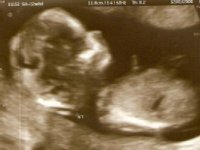 I made it to my nuchal translucency scan on time – early, actually – but the doctor did not. Isn’t that cruel? Leaving a pregnant woman anxious to see if her baby is still living to wait for an extra 45 minutes? Yeah, I thought so, too. Anyway, I think I held my breath from the time I got to the perinatologist’s office until the time I saw the heartbeat flickering on the screen. Long story short, everything seems OK, at least so far. The nuchal measurement, hoped to be under 3 millimeters, was 1.6 at its largest, and the doctor explained that there was fluid in the abdomen – indicating that the baby can swallow – no cysts apparent in the brain, a nasal bone is present, the spine appears intact, all the things I wanted to hear. It was hard to listen though, mesmerized as I was by that amazing creature on the screen seeming to stare right at me. I’m sure she was just looking in the direction of whatever seemed to be intruding on her space … oh, and in case you’re wondering why I wrote “she,” the doctor is guessing that we’ll have a girl. Isn’t it amazing that he can even reasonably assume something like that at this stage? Wow – it is to me. He’s won’t fully commit to that assumption until after my big anatomical scan in early January, and I’m not racing off to paint the nursery petal pink just yet (or actually ever). And, truthfully, I won’t get the full picture from today’s screening until my bloodwork comes back in a week or so, but I’m still feeling a little more confident about things as they are. We broke the news to Mojo last night. We told him that he’s going to be a big brother, and we deliberately avoided using the word “baby” because it seems to be a four-letter word in the worst sense in the preschool circles these days. We also avoided mentioning whether he could expect a little brother or a little sister, because we don’t want to get his hopes up (or down) either way. We explained to him that because he’ll be bigger and he’ll know more things he can teach his younger sibling all kinds of things – how to sing songs, how to play basketball, how to play Donkey Kong. His response to our announcement was … well, simple. Maybe he’s still processing all this, just like his mama. All Akimbo: Is this normal? Wow! Congratulations! A little girl will be so much fun!